At Jade Communications Inc., we have found that if done right, the process of making the lighting in our clients' offices and buildings more efficient is not only a great way to save our clients’ money, but also to improve office ambiance and productivity of staff. The introduction of LED lighting affords greater savings and revolutionary design options. Did you know that on average over a third of a building’s energy consumption is linked to lighting and statistics show that over ½ of that is wasted energy and lost potential savings? This means big savings are possible, not to mention the feel-good benefits for the environment and staff as well. 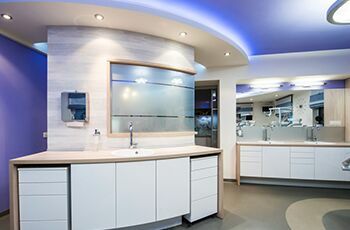 Everyone has lighting in their offices and buildings but generally not SMART lighting. Be sure to ask about smart LED lighting that essentially turns your building into a smart sensor/ sensitive environment that allows for even greater efficiencies. The sensor tech is now so advanced that it can even track lighting, motion, occupancy and more. Contact us today at (561) 997-8552 to find out more about our technical skills and services.